The start of a new year is often a time of reflection, planning and goal setting. For many West Australians, their goals and plans for 2019 will involve property. Late last year REIA released its national Housing Affordability Report, which showed that WA remains the most affordable state in Australia for housing (with only the Northern Territory and Australian Capital Territory more affordable), with the proportion of income required for WA home owners to meet their loan repayments having reduced to 22.7 per cent and the average loan size having declined 4.6 per cent to $339,943. By comparison, in New South Wales, the proportion of income required to meet loan repayments is 36.6 per cent, while the average loan amount is $469,589 – significantly higher than WA. In addition, WA continues to have the highest proportion of first home buyers in its owner occupier market at 35.1 per cent, compared to 23.2 per cent in NSW. Although the Sydney real estate market has started to cool, the dream of home ownership remains out of reach for many people on the east coast. You only need to compare our median house price ($510,000) with Sydney’s (approx. $1.1 million) to recognise the opportunity available to WA buyers and investors compared to our east coast counterparts. If you’ve been thinking about buying or investing in property, 2019 is the year to act. 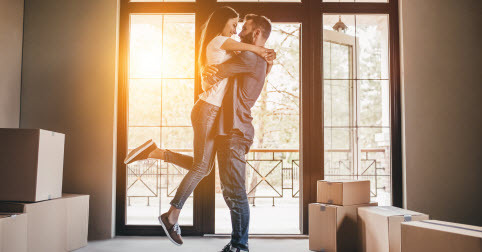 According to the most recent REIWA Curtin Buy-Rent Index, Perth is the most favourable it has been for buyers in five years, with house prices only needing to appreciate by 2.9 per cent over the next 10 years for the decision to buy to be considered more financially beneficial than renting. To put that into perspective, the 15-year annual average house price growth rate in Perth is 5.1 per cent, which should provide West Australians who are weighing up whether to buy with plenty of confidence. Another contributing factor to Perth’s favourable buying environment is the record low interest rates. While lending criteria has tightened in recent times, the official cash rate remains at the historic low of 1.5 per cent. We’ve also seen the 10 year average mortgage rate decline from 7.3 per cent to 6.2 per cent during the last decade, while incomes have increased and house prices in Perth have remained comparative to what they were a decade ago. If you’re thinking about buying or investing, I encourage you to act soon and speak to a local REIWA agent about the opportunities available to you. If you are short on time, or don’t know where you want to buy and would like help to find you a property, then speak to a REIWA buyer’s agent. The Perth market is on the precipice of a recovery and conditions are unlikely to remain this favourable for too much longer.